Well JfnKerry has assured us that he didn't do nuthin. Aren't you gonna believe him? Maybe Kerry is setting the stage for an upset nomination for the 2020 election......please let that happen. O & K are in fact practicing proctologists of sorts. They don't use traditional "scopes" for their examinations of each other, though. They're more into natural methods. No, the Dems want HER again..
No, the Dems want HER again... Kerry wants to be Sec'y of Graft, er, State again... He's never stopped doing the job, right? "They don't use traditional "scopes" for their examinations of each other, though. They're more into natural methods"
That seemed to be the scuttlebutt coming from the Chicago bath houses. .
It’s is really hard to understand why obama and Kerry have been allowed to go abroad and undermine Trumps foreign policy.Can you imagine if someone form the Bush administration had done the same? BTW Kerry and obama would never have been allowed to become proctologists,there would ha e been to many incidents of patient abuse during their residency .Yeah they just couldn’t understand why “dr. Johnny “had both hands on their shoulders during a prostate exam. We don't have to imagine. That would be what they did to General Flynn, among others. He was dispossessed of his home, otherwise financially ruined, slimed by 17 whores, and has yet to be sentenced for being a part of the Trump administration. Are we getting the sense of my admiration for the aforementioned whores? Pet? Like Erdogan calling Flynn Fido? Always informative to see who you asshats admire. mattzine would demand that we impeach Kerry, but he has a crush on him. Lefties are always accusing others of venerating and/or adoring and/or worshipping leaders - thus "orange jesus" and other inane epithets. It's projection: we don't, but they DO. It explains a lot. We can criticise Trump for his many failings, but still support him when he's doing things he was elected to do. They can't - criticism of an object of worship is heresy. This is why "religion words" (e.g. denier, heretic, etc.) keep showing up in their political diatribes, confirming the status of leftism as a pseudo-religion. Yeah, right. No idolatry oF Trump by conservatives. LOL. Not to mention the object of Tom C's wet dreams, Anne Coulter, who's book In Trump we Trust is a testament to the orange-nosing adulation of your bloated leader. Stoolsmith’s comment, and Udall’s cheerleading, show how blind and truly ignorant conservatives are. They know better than anyone else. “WE are capable of critique, but progressives are not.” Which is why this website has such cogent analysis and critique of Trump’s tax cuts and subsidy giveaways and trade policy and deficit growth and playground diplomacy and cabinet mistakes and lack of discipline and inability or refusal to think beyond his own overinflated ego. This totally underscores the need to remove security clearances when administrations leave office. Matt, with his usual vulgar ad hominem attacks, criticizes things he does not understand. We don't criticize things because HE disagrees with them. That's what he should do, not anyone else. It's not our job to promote your inane beliefs. As for the rest, what's your point? 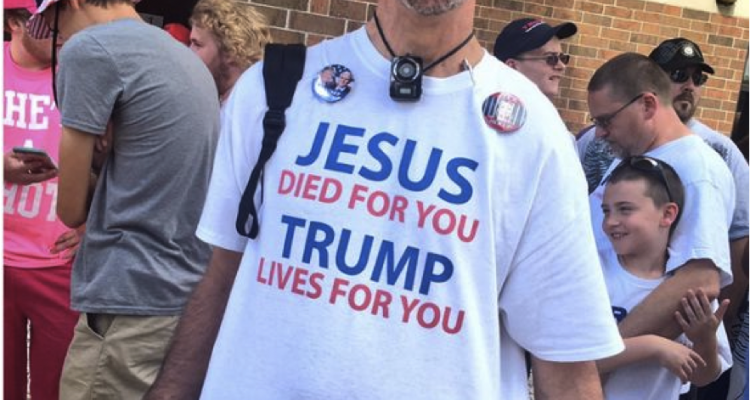 I'd wear one of those shirts just to trigger lefties, not because I think Trump is anything more than a useful expedient. But you just go on projecting. It's what you do best. Back on topic, Kerry and his ilk continue their efforts to evade sanctions. A simple question. In your opinion, is it possible for a progressive to view a dem pol as a “useful expedient,” or wear a t-shirt simply to trigger conservatives? As I understand this, the whole damn bunch of the manchurian's toadies and other whores are steadily slouching towards outright sedition if they in fact have not already arrived. It's easier to criticize than create. Libs "create" more dependency, bigger than ever government, and new and more innovative entitlements. And criticize those who create greater prosperity and stronger economies. Isn't it interesting that they have no answer for a very simple number-as in 4.1%. They want gun control but their mayors run most of the urban slaughterhouses. They insist that Kavanaugh is a predator, but have no witness. Sooner or later the BS response creeps into the equation-bout time isn't it? Is that an attempt at answering a simple question? I’ll tell you what, Stoolsmith, when you take Udall to task for addressing me by something other than my name, I’ll take your own whining about “obscene defamatory distortions” more seriously. Shut up, Matt. You are responsible for your own actions. You attacked me without provocation. There is no excuse. You want to deal with someone else? Do it. Not my job - I'm not the hall monitor here. Complain to the management.